OK, I admit it, I’m a huge Alcatraz fan. I’ve seen every movie made about the island (the Birdman was the best), I love reading historical accounts about prison life, and I’m simply enthralled by the audio tour whenever I visit the old cell block. And on one visit to the Rock, I even got to chat with a former Alcatraz guard. Boy did he ever have some stories to tell. 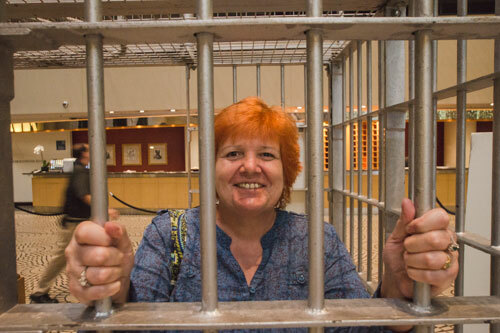 Which is why I was thrilled to find out about the “Alcatraz: Life on the Rock” exhibit at the Hyatt Regency in San Francisco. This free exhibition, runs through October 25, 2013. And don’t let the admission price fool you — the content is excellent; so much so that bus tours even stop there. A taste of what life on the inside was like. 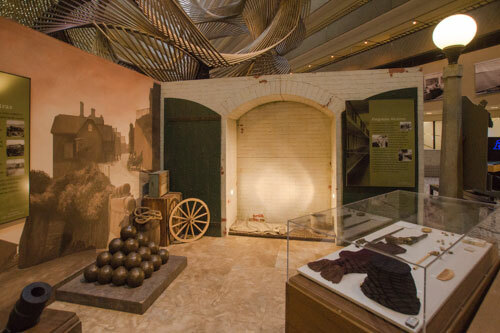 The exhibition begins as you walk through the Sally Port — the secure entrance — and get a peak at what life was like on the inside. There’s even a replica cell complete with a cot, toilet and sink. Of course the prisoners weren’t the only people who lived on the island, and the exhibit also offers a little insight into what life was like for the employees and their families, who also occupied the island. The Alcatraz Women’s Club even produced a cookbook, which they sold to island families as a fundraiser. So it appears that family life was pretty normal there, aside from the prison alarms that could be heard in the distance. There was also an interesting display about Hollywood and Alcatraz. Although 19 movies were made about Alcatraz, most of them were based on myths, as film crews weren’t allowed on the Rock while it operated as a prison. So Hollywood took some liberties. For example, the Birdman never kept birds on the island, but he did raise them when he spent time at Leavenworth. The cells were pretty bleak, when the Army operated Alcatraz as a military prison, during the Civil War. 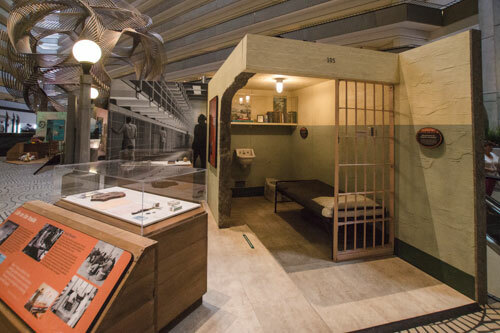 The exhibit on military Alcatraz highlights a lesser-known era on the island. During the Civil War the army established a military prison there, which operated until 1933. And from the looks of things, the prisoners got the bare minimum. Although the federal prison wasn’t exactly the Ritz, at least they had cots. Not so when the Army was in charge. Interestingly enough, the military prison operated twice as long as the federal prison. A military post was also set up on Alcatraz Island to insure the safety of the Union’s goldfields, during the Civil War. 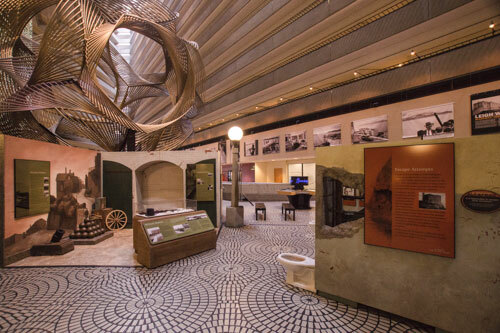 “Alcatraz: Life on the Rock” is rounded out with an exhibit about the Native American occupation from 1969 to 1971, and an interesting display about Alcatraz preservation efforts. There’s also a short film about Alcatraz produced by Alcatraz Cruises. There's barrier-free access throughout the 3000 square foot exhibit in the Hyatt Regency's Atrium Lobby. As an added bonus the 3,000 square foot exhibition also includes “Alcatraz: The Last Day” a photo exhibition by Life Magazine photographer Leigh Wiener. The photos were taken on March 21, 1963, the day that the prison closed. In 2012 Devin Wiener discovered a treasure trove of his father’s unpublished photos, and later published them in “Alcatraz: The Last Day”. Today, 25 of those images have been enlarged for this special exhibition. It’s the perfect compliment to “Alcatraz: Life on the Rock”, as it adds a human component to it all. Wheelchair access is good throughout the entire exhibition too, with elevator access to Atrium lobby from the valet parking elevator. It’s also close to the Embarcadero BART station, which has elevator access on Market Street. And if you’d like to make a weekend out of it, the Hyatt Regency also has some very spacious accessible rooms with roll-in showers or tub/shower combinations. Try and fit in an Alcatraz visit too. Even though it is hilly, it is wheelchair-accessible. And while you’re in the city, make plans to visit The Rock. Although the cell house is at the top of a hill, disabled visitors can take the accessible SEAT shuttle to get to the top. Additionally, all of the boats out to Alcatraz are wheelchair-accessible, but plan ahead because tickets are almost never available on a walk-up basis. Just surf on by Alcatraz Cruises, buy your tickets online and print out your boarding passes. It’s that easy. Either way, don’t miss “Alcatraz: Life on the Rock”, as it presents a comprehensive view of some of the lesser known aspects of the island prison. 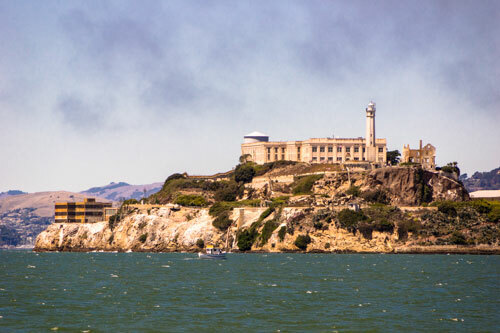 This entry was posted in Attractions, Attractions, Events, Lodging, Uncategorized and tagged Alcatraz, barrier-free, disabled, exhibit, handicapped, Hyatt Regency, Leigh Wiener, Life on the Rock, San Francisco, travel, wheelchair by Candy B. Harrington. Bookmark the permalink.